Centrally located 2 story, 4 BR, 2 Bath historic cottage near the beach. This Beach Cottage built in the early 1900's approximately a block from the beach. The cottage sits on two large lots in a tropical setting of palms, large banana trees, camellia's, and oleanders. You will relax outdoors on the front porch or in the garden patio area complete with grill and fire-pit. Sorry, not wheelchair accessible. The two story property offers a true cottage feel with original hardwood floors and eleven foot ceilings upstairs. Here you find a cottage style kitchen, one bath, two bedrooms and a sitting room. The upstairs is furnished with one queen bed, one double bed and a queen sofa sleeper. The downstairs area has a beach inspired decor that will brighten your day. There you will find two bedrooms providing a queen bed and two twin beds. Additionally you will find a day bed in the family room. Downstairs includes one bath and a large laundry room. The property is located one mile west of the Island View Casino and close to Historic downtown Gulfport with some of the best seafood restaurants the coast has to offer. Also nearby you will find Gulfport harbor which includes a free children's splash park and hosts many festivals, boat shows, Ship Island excursions, and fishing charters. Just steps away you will find the kid-friendly Westside park which includes a splash pad and the westside fishing pier. You will enjoy long walks on the white sandy beaches, watch the sunrise across the barrier islands. All the while experiencing what the Mississippi beach life has to offer. For the Sportman, guided fishing trips can be arranged as well. The owner is an avid fisherman and local fishing guide. All tackle, bait, fish cleaning, and valuable information included. Check him out at ReelOutlawCharters.com and WildBills-fishin-blog.simplesite.com. This property has been in my family for many years. In the past we have shared this cottage with friends and family as a weekend getaway. We now offer our home as a vacation rental. Our family has always enjoyed the Coastal life. Fishing is one of our favorite things to do and we still enjoy it today. The beach lifestyle is so accessible here. Everything is within walking distance or bike riding distance. No cars necessary to enjoy the sandy beaches or fishing piers. It is centrally located to the unique shops in Bay Saint Louis and Ocean Springs. There are so many festivals and events to experience; such as the fishing rodeo's. There is nothing like seeing the gamefish brought in daily during the Mississippi Deep Sea Fishing Rodeo, held annually on the Forth of July weekend. This event is held right down the street at the Gulfport Harbor/Jones Park. toilet, tub, Bathroom is upstairs. Upstairs bath has tub and downstairs bath has tub/shower combination. Beautiful downtown Gulfport is just a mile away. The beach is just a block away. Central Ceiling Fans upstairs rooms. Central Outdoor fire-pit on Patio. Outdoor dining are w/umbrella, lounge chairs, and fire-pit. We thoroughly enjoyed our brief stay at the Cast-A-Way! It is a delightfully decorated free-standing home on the western edge of Gulfport. We found that the owners had provided everything we needed to enjoy our stay. The only minor surprise was a lack of wi-fi Internet. Ours is a family of six, and we noted when making the reservation that the kitchen table would only seat four, so that was a foreseen challenge... Prior reviewers complained of the downstairs tub not draining properly; I can report that issue has been resolved... 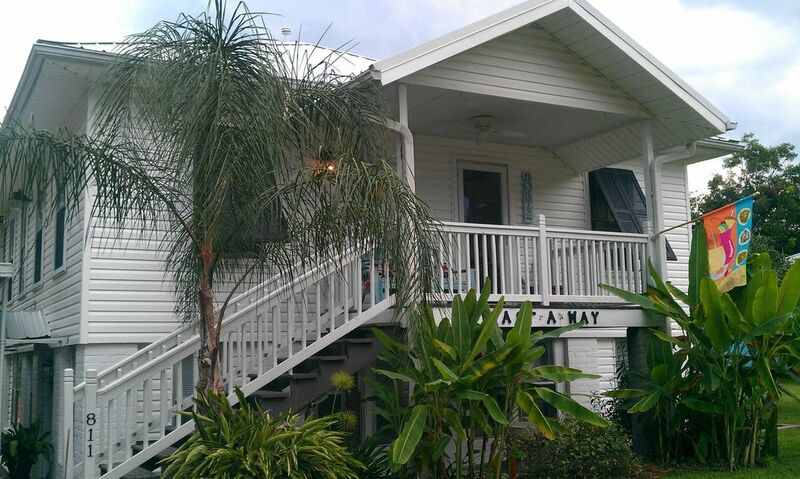 In a nutshell, we highly recommend this property for anyone looking for accommodations in Gulfport! We had a great time at the Castaway Cottage for a Christmas/New Year’s Family getaway! The cottage was beautifully decorated and even had seaside Christmas decor. With only one tv, our kids were forced to talk with each other and their cousin. We had a great time exploring Gulfport, Biloxi and Ocean Springs and the Waffle House just down the street was an added benefit as my husband and father do love their grits! So good to hear from our guests. We are glad to have you anytime. We look forward to your next visit. It was a great place for six women enjoying an annual get together. The place was great. The only drawback was very poor drainage in the downstairs bathroom. The layout was great for us to all gather or to separate for quiet as needed. We loved it!!! Home away from home. All the conveniences of home with room to spare! Thank you we will be visiting again. Thank you so much for choosing our home to spend your Family Vacation. We look forward to your next visit. We had a great stay in your house. It was very comfortable and cute. It was an easy walk to the beach and convenient to great restaurants. It’s always a pleasure to share our home with visitors to the Coast. We look forward t your next visit. Centrally located to all Coast Casinos, Outlet Malls, award wining Restaurants, Deep Sea Fishing, Cruising the Coast, Ship Island Tours, Water Parks, activities and festivals. One hour east of New Orleans, Louisiana and one hour west of Mobile, Alabama. A damage deposit may be required at booking for parties over six at the owners discretion. All rates subject to change. Note: There is additional parking space for a second vehicle or small boat. The bottom floor has lower than normal ceilings. UNDER NO CIRCUMSTANCES shall the furniture be re-aranged or moved without written permission from the owner.